Now that we are in the full heat of summer, it’s tempting to gather all of our indoor tropical plants and put them outside… because all plants love lots of light, right? Not exactly. Different plants require different amounts of light. A plant getting too much, or too little light has potential for all sorts of problems. Light related plant health issues include yellow leaves, black leaves, pests (like fungus gnats and spider mites) and or even drooping and/or shedding leaves. 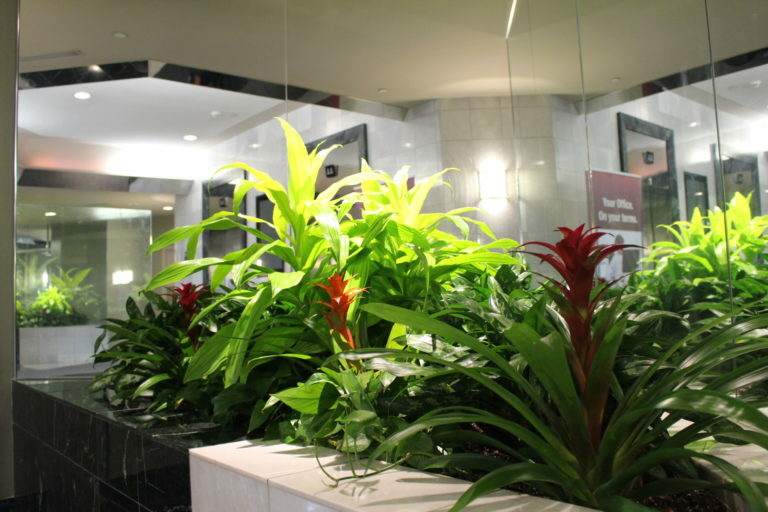 In a commercial environment, light is one of the most important factors we take into consideration when choosing plants. There are three categories of light requirements for interior tropical plants – low light, medium light and high light. Despite popular belief, no light is not a category! So we understand all plants need some light, now what exactly does low, medium and high light mean? Those categories can be difficult to define without a starting point, so let’s look a little closer at each group. High light. Think South, East, or West window. Direct sunlight. A high light plant needs to be directly in a window, with direct sunlight. Direct sunlight is important to note – a South window shaded by a tall office building or condo will not fall into the high light category anymore! A few examples of high light plants include Ficus lyrata (Fiddle Leaf Fig), Schefflera arboricola (dwarf umbrella tree), or any variety of Cactus. Medium light. Think North, East, West or skylight window. Distanced sunlight. A medium light plant usually has the flexibility to be directly in any of these windows, or slightly pulled away where they still receive indirect sunlight. In the instance of a plant underneath a skylight, the plant has direct light, but it is far enough away that it is not too hot. (We love skylights, they encourage interior tropical plants to grow tall, strong and evenly). A few examples of medium light plants include Schefflera ‘Amate’ (Umbrella Tree), Aglaonema (Chinese Evergreen) or Chamaedorea elegans (Neanthe Bella Palm). Low light. Think filtered light or no natural light, only fluorescent. Most tropical plants that are able to tolerate low light conditions are also able to live in medium light conditions. Smaller table top plants, rather than large floor plants, are also more tolerant of low light conditions. Some examples of low light plants include Sansevieria (Snake Plants), Epipremnum (Pothos), Dracaena deremensis ‘Lisa’ (Lisa Cane), and Howea forsteriana (Kentia Palm). A trained horticultural technician is skilled in identifying light conditions and is able to make educated plant recommendations for that reason. The right plant, in the right light, is the key to a successful plantscape.